System1 is a market-maker that creates liquidity for large digital advertising networks while ensuring privacy & delivering better experiences for consumers. The company uses data science to build sophisticated consumer profiles and leverages deep integrations with major search engines, social platforms and native/display networks to tap into consumer intent and deliver more targeted advertising on a massive scale. 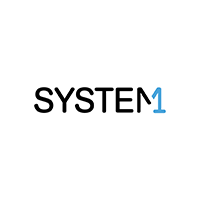 System1 is privacy-first and protects consumer data via our fast-growing internet security division.